Denver-based Western Union is the world's largest money-transfer company, spin-off from First data FDC in 2006. The company's agents provide other financial services, including check cashing, bill payment, prepaid cards, and money orders. Its customer base is immigrants who send money to their home countries. Size: WU handles approx. 20% of international money transfer transactions vs. MoneyGram MGI, the company's closest rival, controls about 3% of the market. Its operating margins are twice that of its closest competitor. Network: Network of worldwide agents covering 40 countries and 120 currencies. Its network has grown from 271,000 agents in 2006 to 500,000 agents in 2014. Brand: Recognised brand and trusted brand. Alternative methods of payments: Main fears surrounding the company is that the business model looks potentially obsolete given the global trend toward electronic payments. Western union is prone to regulatory risks as regulators closely monitor for any illegal money transfers. Acquired Custom House in 2009. Acquired the global business payments division of Travelex Holdings Limited Trends in 2011. Securities and Exchange Commission is investigating claims by former employees of Western Union that the company has misrepresented the performance of its digital unit. Increase in compliance cost: This is a mixed development as increasingly complex compliance environment could create higher barriers to entry and Western Union is likely better positioned to absorb these changes over time than its smaller peers. Increasing competition in online money transfer services with the Facebook, Xoom and Walmart entering the money transfer market. One point worth noting is that Western Union’s growth in electronic channels continues to exceed the growth of Xoom, a purely electronic competitor. Loss of about 7,000 agents in Mexico due to compliance issue, permanently dmaging its position in this corridor in the year 2012. Operating margin has been under pressure in the last few years. Strong growth in non-cash based transfers. As noted earlier, it's growth in electronic channels continues to exceed the growth of Xoom, a purely electronic competitor. Money transfer segments aimed at Asia is growing rapidly but only accounts for less than 10% of total revenue. 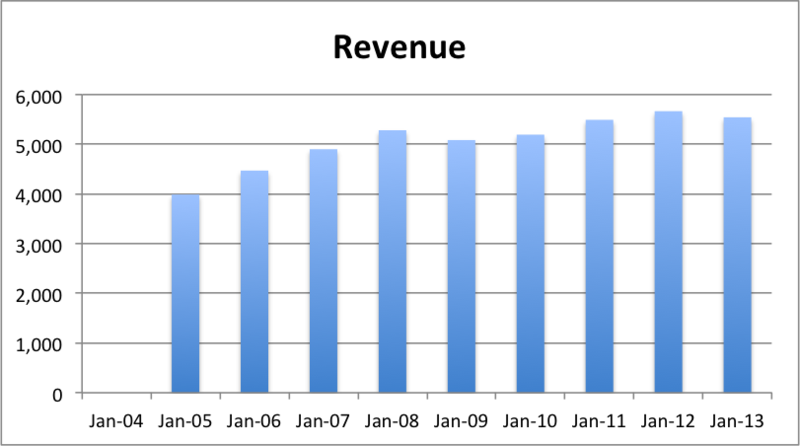 The following graph outlines the revenue growth of Western Union (WU) in the last 10 years. The revenue for Western Union has more or less remained stagnant in the range of 5 to 5.5 billion range. Between Jan-05 and Jan-13 the revenue grew at a CAGR of 4.20%. The table below shows the owner's earnings in the last 10 years for Western Union (WU). 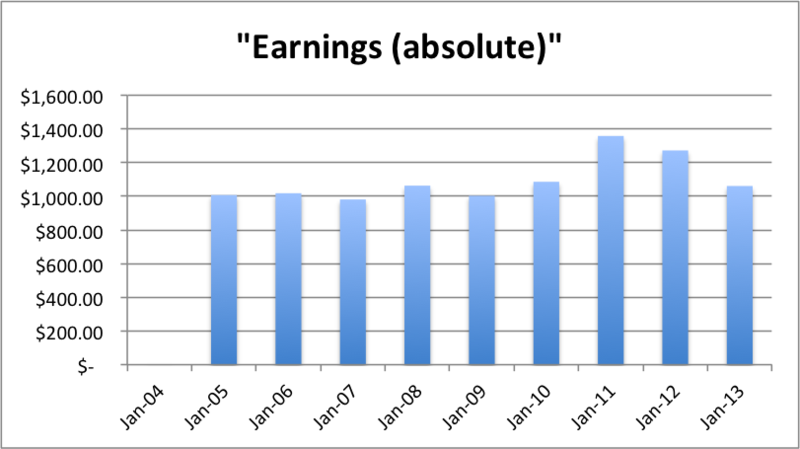 Not surprisingly, the earnings pattern is also quite similar to that of revenue pattern with no growth (CAGR of .66%) in earnings in the last 8 years. As a result of depressing valuation (mostly at a PE of less than 14) and share buyback program, WU has been able to grow the earnings per share (EPS), at a mediocre CAGR of 4.12%. In the last 10 years, Western Union (WU) has spent an average of 25% of its owners earnings on capital expenditure. Over the last 10 years, WU has spent a total of $1.8 billion on acquisitions. As is evident from the earnings growth chart a more prudent use of that capital would have been to return it to shareholders. 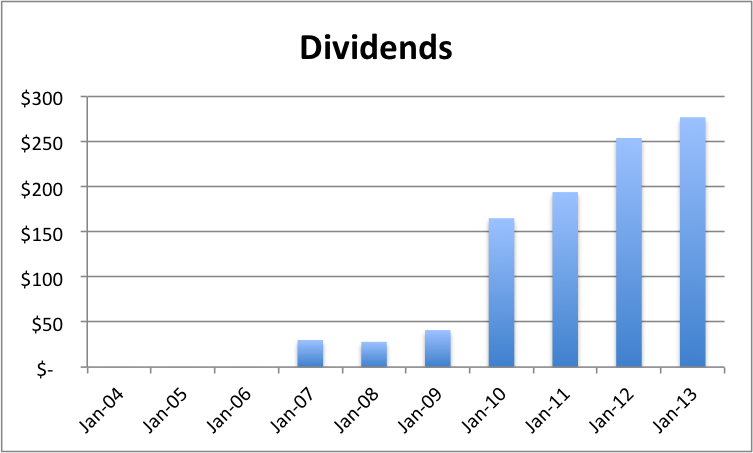 In the last 6 years, the dividends have increased at a CAGR of 44%. Future dividend growth is very likely to be within 5-7% growth rate as the dividend payout ratio creeps up. 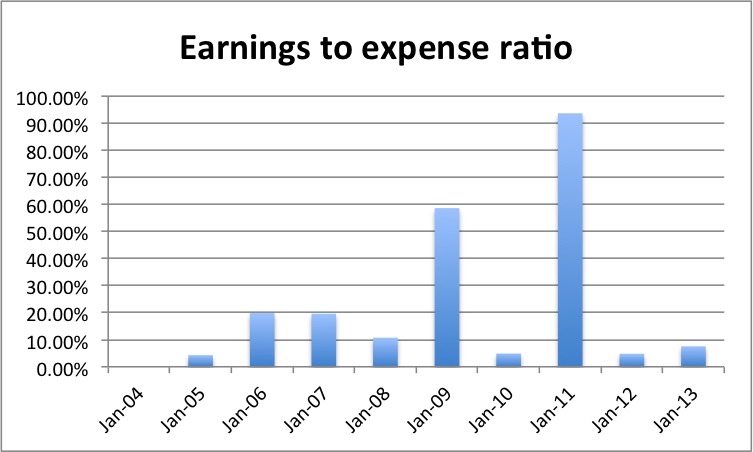 The dividend payout ratio is 25% of its total cash earnings. 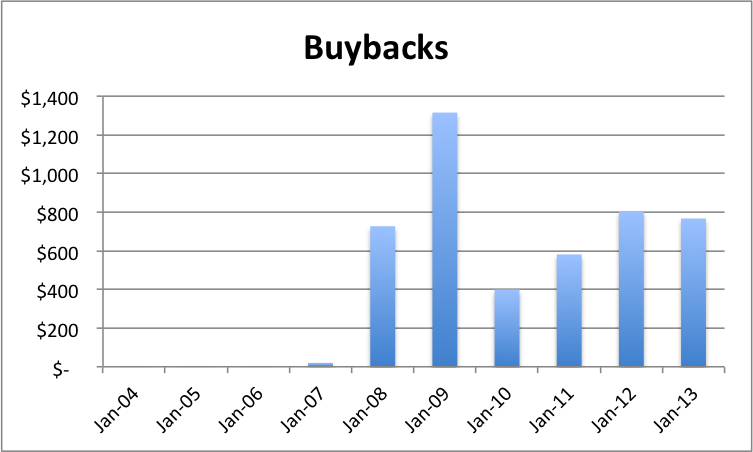 The graph below outlines the total amount of money Western Union (WU) has spent on buybacks. 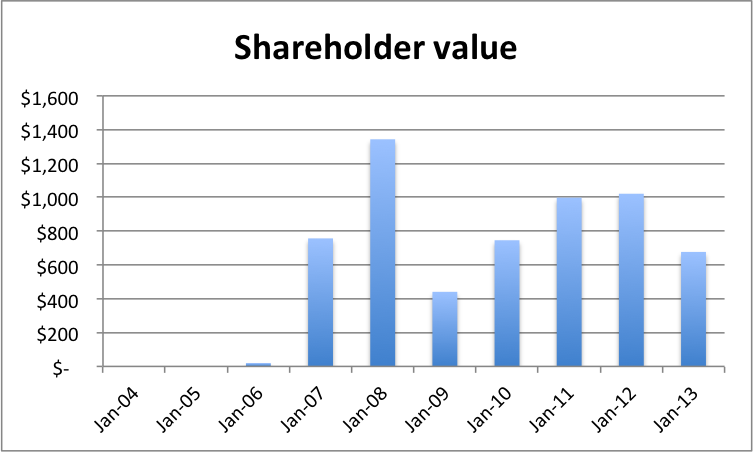 The graph below outlines the total amount Western Union (WU) has returned back to shareholders in the last 10 years through dividends and share repurchases. On an average Western Union (WU) has been able to return 60% of its total owner's earnings to shareholders through dividends and share buy backs. Western Union earnings growth is likely to remain stagnant in both near and long term future. In my opinion, WU's depressing valuation (the more depressed the valuation, the greater the effect of buy backs) and its market leader status makes this an attractive company. The current market cap for Western Union (WU) stands at $8.6 billion and at a trailing P/E of 11.30. At current share price ($16.17) WU delivers a dividend yield of 3% and shareholders earnings yield of 7%. Based on my valuation, I believe Western Union is currently reasonably priced at $16.17 for long term investment.